The casket is carried during the funeral service for U.S. evangelist Billy Graham at the Billy Graham Library in Charlotte, North Carolina, March 2, 2018. The life of the Reverend Billy Graham was celebrated at his funeral Friday, the culmination of more than a week of tributes to the most charismatic evangelical minister of his generation who conveyed a message of salvation to millions of people. 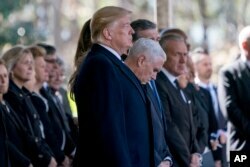 President Donald Trump and Vice President Mike Pence were among some 2,000 people to attend the private ceremony at the Billy Graham Library in his hometown of Charlotte, North Carolina. President Donald Trump and Vice President Mike Pence, center right, arrive at the funeral of Reverend Billy Graham in Charlotte, N.C., March 2, 2018. Graham died last week at the age of 99 after more than 60 years of preaching to millions of people at large rallies and tens of millions more on radio and television. A rare tribute was paid to Graham earlier this week when he became the first religious leader to lie "in honor" at the U.S. Capitol Rotunda in Washington. Only three other civilians have received that distinction. Graham was to be laid to rest next to his late wife, Ruth, in the library's prayer garden. His simple casket was made by inmates at the Louisiana State Prison. The grave marker of "America's Pastor" — as he was originally called by former president George H.W. Bush — reads: "Preacher of the Gospel of the Lord Jesus Christ."